Performance Research Books publishes generously illustrated and finely designed books that present documentation and analysis of contemporary performance practice – through the work of individual artists, companies and ensembles. Each publication combines texts, scores and critical reflection on a distinctive body of work, together with scholarly and theoretical analysis of the practice, the voices of practitioners, the view of the makers and the evidence of the work. Performance Research Books publishes and commissions work that stems from a scholarly engagement with artist-led research and practice. Each publication seeks a lively conversation between theory and practice and the work is revealed and illuminated through dialogue and discourse exploring a variety of formats: interviews, photo-essays, performance texts, scenographic designs, scores, notes and critical analysis. Performance Research Books is an independent venture of Performance Research, a specialist journal founded in 1996 and published bi-monthly (from 2012) that aims to promote a dynamic interchange between scholarship and practice in the expanding field of performance. Interdisciplinary in vision and international in scope, its emphasis is on contemporary performance arts within changing cultures. Performance Research Books is an imprint of ARC, a division of the Centre for Performance Research Ltd, an educational charity limited by guarantee. 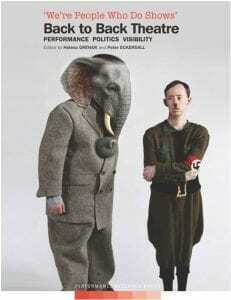 The Centre for Performance Research is located in Wales and works internationally. The books of the Inside Performance Practice series will focus upon the work, process and aesthetic strategies of specific companies, ensembles and individual artists. Projects in process include: BADco (Croatia), Ong Keng Sen/TheatreWorks (Singapore), Alicia Rios (Spain). Engaging with and advancing new thinking across performance forms and a variety of theatre practices and companies. Thinking Through Performance will enable, through translation, emerging and ground-breaking critical theory about performance, otherwise inaccessible to an English speaking readership. We are delighted to launch this series with Valentina Valentina’s intellectually thrilling Worlds, Bodies, Matters (translated by Thomas Simpson) and this will be followed soon with Performance, Philosophy, Labour by Bojana Kunst (translated by Una Bauer). The long anticipated translation of the ‘breakthrough’ Italian publication Mondi, corpi, materie is now available. What myths nourish today’s theatre? What imaginary worlds does it evoke? What are its recurring stories? What are its visions of the world? 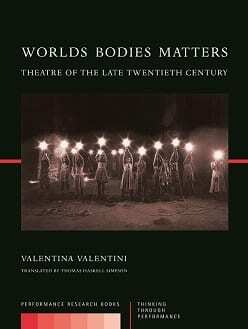 In this study of late-twentieth-century theatre in Europe and the Americas, Valentina Valentini analyses the changed relations between theatre and contemporary reality, between actors and their characters, and examines new roles demanded of both producers and audiences in the realization of theatrical art. In particular she identifies and traces the decisive influence of visual arts and new media on today’s performance scene, a confluence of artistic practices that, Valentini argues, restores theatre to a privileged space in the panorama of contemporary art and aesthetic reflection.